This tutorial covers the basic formatting for configuring a method's inputs and outputs in a workspace. There is also a video tutorial, that explains this and other concepts in more detail if you prefer. As a reminder, the inputs and outputs are defined in the WDL. FireCloud interprets the WDL and provides you an input "form" to fill out. The outputs part of the form is optional. This example shows just the workflow portion of a WDL and what the inputs and outputs look like filled out in FireCloud. Look at the WDL code. How many workflows and tasks do you see? Answer: The WDL includes one workflow with two tasks. There are inputs listed for the workflow and separately for the tasks, followed by outputs for the workflow. In the Inputs diagram, you can tell the difference between workflow inputs and task inputs by looking at the name. 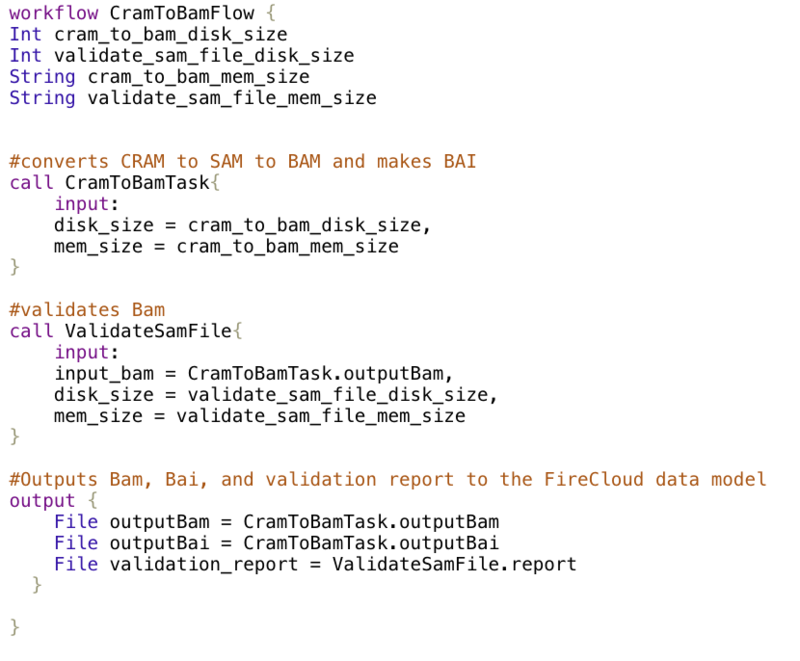 The first four inputs named CramtoBamFlow, are the workflow inputs according to the WDL. 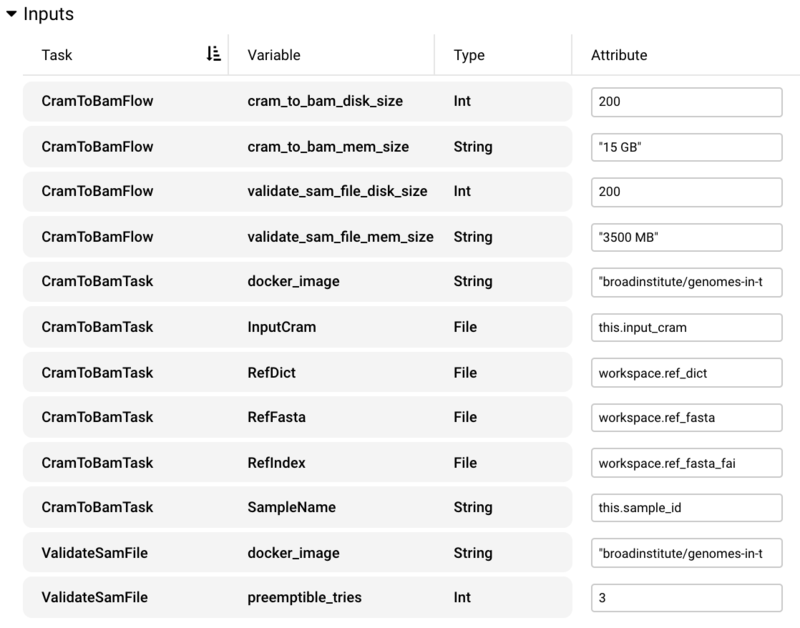 Upload the method to the Method Repository and export it to a workspace. Uncheck the checkbox “Configure inputs/outputs using the Workspace Data Model” within the method configuration. Upload the input json file by clicking “Populate with a .json file.” FireCloud then populates the configuration with the attributes listed in the json file. Review and edit if necessary. Click "Launch Analysis". If you want to use call caching, leave this checkbox checked. The output files will be placed in the Google bucket after completion and will not be registered in the data model. When you fill out the Attribute section per input, you have to follow the formatting requirements based on the type listed. See the Inputs diagram above for examples. Workspace attributes have slightly different formatting. Integer - No formatting required. String - Quotes required. e.g. "my string"
Boolean- Quotes required. Case insensitive so "true" or "TRue" or "TrUE" are the same. File - can be referenced from the Google bucket, data model, or workspace attribute section. See the Referencing files section below for details. Array[X] - Lists of these attributes can be entered with a comma between each item. e.g. "a","b","c" or 1,2,3 or "true","True","TruE","TRUE"
Google bucket - Use "gs://url-to-file-in-bucket" to reference the Google bucket file. Please note the quotes are necessary if you are directly referencing a file URL, but the quotes are not necessary if you reference a file using the data model or workspace attributes below. Workspace attribute - Storing an input as a workspace attribute is convenient if you are using a file over and over again in multiple methods. If the file path changes, you only have one place to update, similar to global variables in scripting. You can call this by typing workspace. plus the attribute key. For example, workspace.ref_fasta or workspace.ref_dict If you type workspace. into the method configuration, all the workspace attributes available will auto-populate below. See how to format workspace attribute values here. If you are using the data model for your analysis, you can optionally fill out the outputs with the same nomenclature (workspace., this., etc.). It is optional because your outputs will go directly into your bucket without defining anything here. If you want links to the output file destination in your data model, you need to define it here. Determine the name of the column or use a pre-existing column and type this. in front of it. For example, this.analysis_ready_bam will output the BAM to the column called analysis_ready_bam in the sample tab (if you chose to run this method on a sample). If the column header doesn’t exist now, the method will create it after execution. When you create a method or a method configuration, FireCloud will give it a number (starting at 1) to identify the version. This is called a snapshot ID and can be found in the method and method config header along with the name, owner, documentation, etc. Every time a method or method config is edited, FireCloud automatically adds 1 to the ID. You can keep track of what method snapshots you have launched in the Monitor tab.